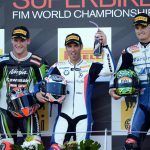 Tom Sykes and Eugene Laverty each came away with a victory as the World Superbike Championship made its return to Mazda Raceway Laguna Seca. 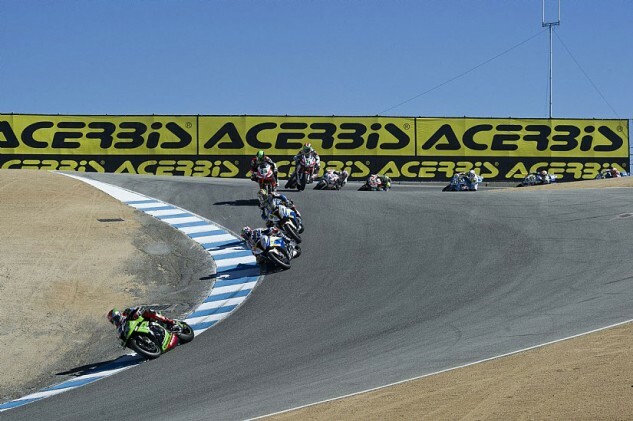 The first race featured two red flags, ironically caused by AMA Superbike regulars Danny Eslick and Roger Hayden, the two men with the most recent experience at the famed track. The second race was a much cleaner affair, with a dramatic finish, setting up the final two rounds of the championship. The first race started with a terrific start by pole-setter Sylvain Guintoli. The Aprilia rider had been leading the championship for most of the season but has recently begun to lose ground to his teammate Laverty and current series leader Sykes. Guintoli led for the opening six laps, developing a two-second lead over Sykes. That lead was wasted however after Jordan Suzuki racer Eslick crashed into the air fence at Turn 5, bringing out a red flag. On the restart, Guintoli had another strong start, but Sykes managed to stay close to his tail. Guintoli led for eight more laps with Sykes staying less than a half second behind when a red flag was brought out again. This time, the flag was raised after both Pata Honda‘s Leon Haslam and Eslick’s teammate Hayden crashed out at Turn 4. The race was once again restarted, with the original 26-lap race reduced to a 12-lap sprint. 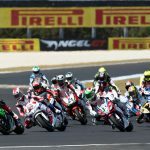 This time, Guintoli got off to a poor start, bumping with Sykes while the BMW GoldBet pair of Chaz Davies and Marco Melandri jumped into the front. Davies, who has some experience at Laguna Seca from his three years in AMA competition, led for the first nine laps. Sykes meanwhile began to move his way up, first separating himself from Guintoli and then tracking down Melandri before turning his sights on Davies. Finally, the Kawasaki rider moved ahead on Lap 10. He would hang on to win by 1.253 seconds ahead of Davies with Laverty edging out Melandri for third. Guintoli, despite leading every lap before the two red flags, settled for fifth. The second race began with Laverty taking the holeshot followed by Sykes and Guintoli. Laverty led the opening three laps before being passed by Sykes. 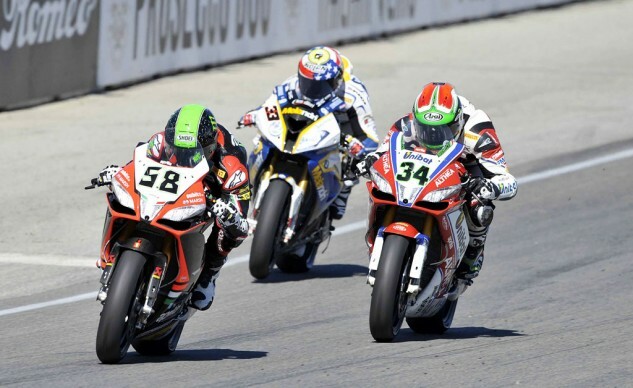 Guintoli remained in third but later began loosing ground to Melandri and Davide Giugliano from Althea Aprilia. Giugliano took over the second slot behind Sykes on Lap 9, with Laverty within striking distance. The top three riders remained in those positions for much of the race before Laverty began his challenge on Lap 23. Laverty pulled off nearly the exact same move on Turn 5 to first pass Giugliano on Lap 23 and then again on Sykes. Laverty would hang on for the win, followed by Giugliano and Sykes. The Jordan Suzuki riders had better luck in Race Two. Hayden finished eighth while Eslick was 14th to pick up a couple of championship points. 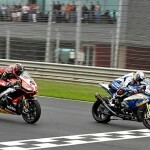 The WSBK Championship now heads back to Europe for Magny-Cours in France. Sykes remains in the lead but Laverty has now moved ahead of Guintoli for second in the championship race with two rounds remaining.